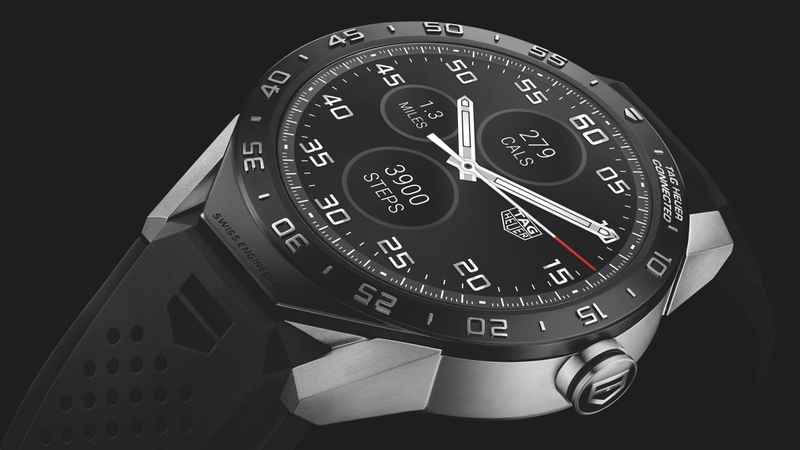 The Tag Heuer Connected has been unveiled over in New York, amid the fanfare of being the first 'luxury' Android Wear smartwatch. It even had its own ceremonial cheese. As well as being a partnership between Tag and Google, it's also the first smartwatch to boast an Intel chip inside. Here's everything you need to know about the Tag Heuer Connected. As you'd guess from Tag's first smartwatch, design is paramount. The Tag Heuer Connected boasts a 46mm build (that's an unashamed man-sizing) with the case and lugs made from grade 2 titanium. It's all covered by a crystal sapphire, eschewing the toughened glass of rivals in favour of something more luxurious. The Tag Heuer Connected measures 12.8 mm deep on your wrist, which is a fair old chunk of titanium, making it fatter than most Android Wear watches to date. However, the chosen material pays off and it only weighs 52g. Interestingly, the Connected comes with a black rubber strap, which can be changed for the colour versions shown above. These are, of course, sold separately. Intel is on board as a partner, powering the Tag Heuer Connected with an Intel Atom Z34XX processor. For silicon fans, it's the same one found inside the Intel Edison development board, which was the platform for a host of wearable devices including the recently revealed Blocks. The screen itself is slightly underwhelming, and we don't think anyone will mistake the Tag Heuer Connected for a Carrera Cal16 mechanical watch. The 360 x 360 LCD only boasts a pixel density of 240ppi, which already lags way behind the competition. To put that in perspective, the Huawei Watch has a 1.4-inch 400 x 400 display with a ppi count of 286; the highest of any Android Wear device to date. However, the soon-to-launch LG Watch Urbane Second Edition will trump everyone with a 480 x 480 panel at 348ppi. Elsewhere, there's 4GB of storage on-board – standard for Android Wear devices – and the Tag Heuer Connected is IP67 rated. Jean Claude Biver promised all-day battery life and it's powered by a 410mAh battery, which should offer a minimum 25 hours battery life. Tag Heuer has always traded on its 'Swiss Made' label, which is seen as a mark of extreme quality in the watch making world – and this has attracted a fair amount of scrutiny about how it would brand its first smartwatch – with components coming from Silicon Valley and manufacturing in China. Well, the Tag Heuer Connected will be branded 'Swiss Engineered' which means very little, but is a nice nod to the history of the brand. Back at Baselworld Wareable was told by Tag that the Android Wear smartwatch will be upgradeable, to extend the lifespan of the product. Tag Heuer's tagline refers to eternity and the company says it was simply not willing to create a product that couldn't last forever. Users can opt top have their Tag Heuer Connected changed for a mechanical watch in the future, should they opt not to upgrade to future Tag smartwatches. It won't be upgraded for free, of course. Don't talk crazy. In fact, it will cost exactly the same for the replacement mechanical fitting as the original smartwatch, with the work costing $1,500. The Connected runs Android Wear, a platform that hasn't been known for customisation so far but Tag has done its best to make it as high end as possible. Unsurprisingly Tag has taken care over the watch faces with three digital faces in black, deep blue or pearl white available at launch. All show the date window and include other details from Tag Heuer's Carrera watches such as the hands, index, chronograph counters and minute track to make the Connected look as much like a mechanical watch as possible. Tag is taking the idea of live dials further than the likes of Motorola, with an emphasis on the Connected's watch-like functions of timer, alarm and stopwatch too. Tag calls the live information "interactive counters" and these appear on watch faces to give you easy access to things like weather updates, alerts or sports news. There are three counters on chronograph dials at 6, 9 and 12 o'clock and touching a counter opens the third party app in full screen. Tag isn't just settling for Android Wear apps either, it has developed its own SDK and already has four exclusive apps which integrate with its bespoke watch faces. These include Insiders, RaceChrono Pro, Viewrangers and GolfShot Pro, three of which have a sports focus, and all of which comes with free subscriptions when you buy the smartwatch. As well as Tag's efforts, users also have access to Android Wear apps - voice search, Maps, Translate and Fit are all key apps on the Android Wear platform and the Tag Heuer Connected is no different. The Tag Heuer Connected smartwatch is now on sale for $1,500. It's going to be limited to 1,000 pieces at first (a classic watch maker's move) rolling out in New York and in Europe. You can find out more details over on the Tag Heuer website.